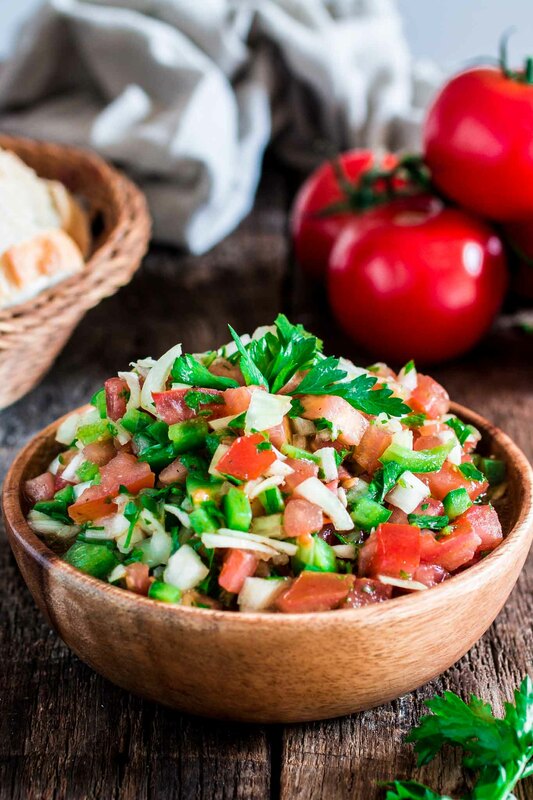 If you’ve ever been to a Brazilian restaurant, you know that our “vinagrete”, or Brazilian Vinaigrette Salsa, is a must! Traditionally served with feijoada or with any grilled meat, chicken or fish. Aaaaand I’m finally back in NYC from a very intense week in Salt Lake City. I flew to that beautiful (and dry! Oy!) city for the Everything Food Conference, where not only I learned a lot but made lots of new amazing food blogger friends! However, fatigue got the best of me and I got sick the day I was flying back home and am still recovering from that. ??? I guess that’s what happens when you decide to make friends with party animals who want to go out drinking after a long and busy day, even though they’ve been awake since 6am. Shadi and Andrea, I’m looking at you! ? Good thing I’m almost 100%, right on time for Memorial Day weekend festivities! Which brings me to the subject: Memorial Day food. Memorial Day is considered by many the unofficial start of summer and it’s one of the three most popular days for grilling out. 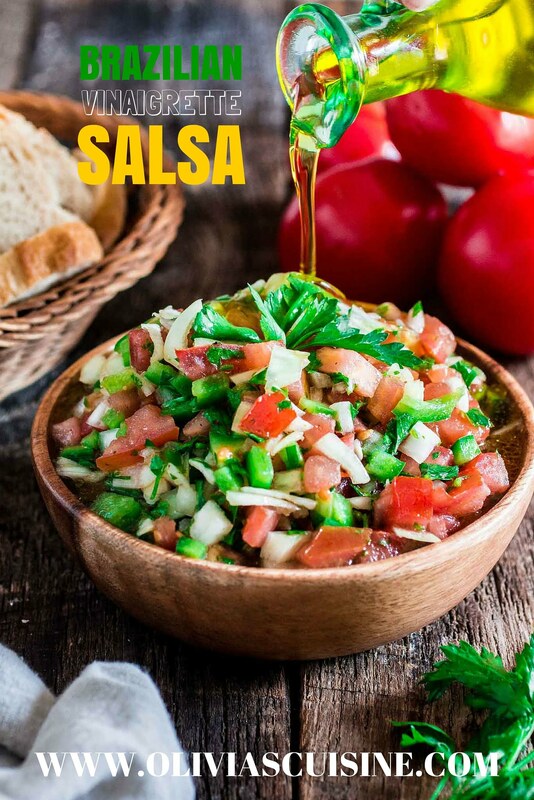 So I figured some of you might be looking for different recipes to try this year, which inspired me to share this Brazilian Vinaigrette Salsa. 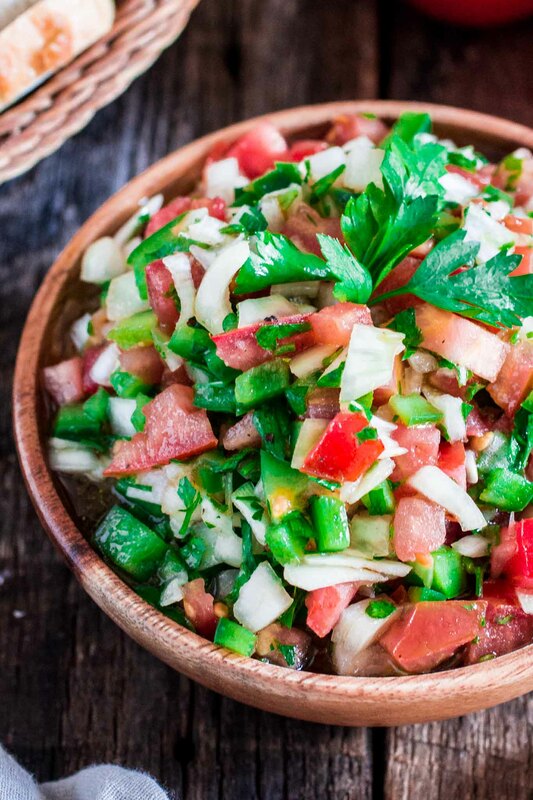 If you’re looking for a spicy salsa, this recipe is not for you! The “carioca” (meaning: from Rio de Janeiro) version of Pico de Gallo is very mild and has green and red bell peppers instead of jalapeños. The paulista (from São Paulo) version is even milder, without any peppers at all! And while the Mexicans use lime juice to bind it all together, we use olive oil and vinegar, hence why we call it “vinagrete”. 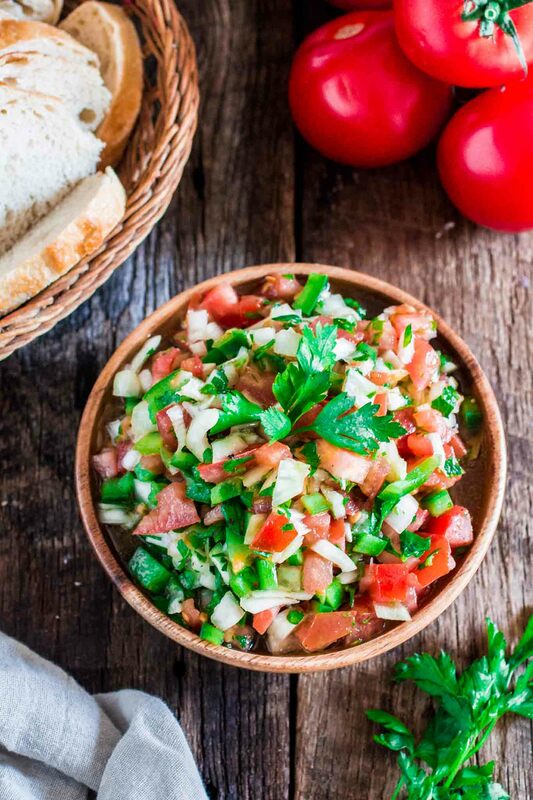 Brazilian Vinaigrette Salsa makes a great accompaniment for grilled meat, chicken or fish and is a must at any barbecue or steakhouse in Brazil. It is also traditionally served with feijoada, or black bean stew, which is our national dish! I can go through a whole bowl by myself, just with some pão francês (our small french rolls) even before lunch or dinner is served. Oh yes, it is very addictive, so try to stay away from the table until food is served, or there won’t be any vinagrete to go with your meal! 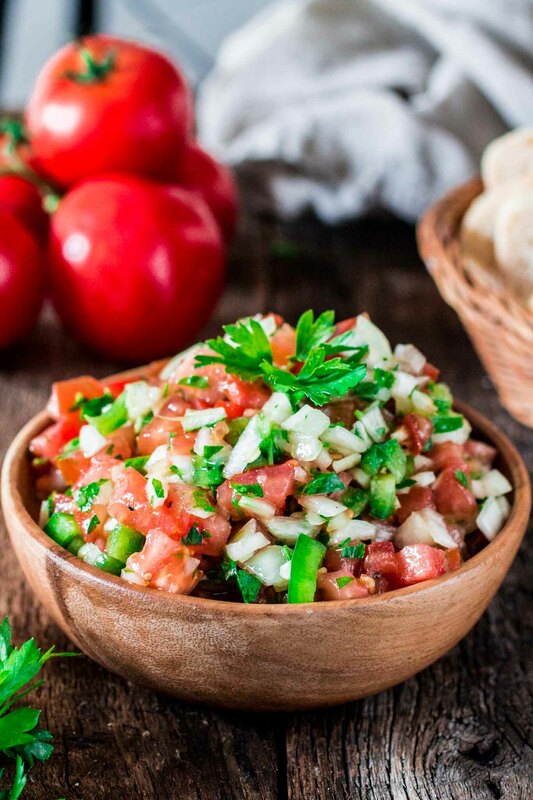 If you’re looking for something new to try this summer, I highly recommend our vinaigrette salsa. It is not only deliciously fresh but super simple to make! 1) The vinaigrette tastes even better if you let it rest at room temperature (or in the fridge) for about 30 minutes to one hour! 2) Brazilians usually make vinaigrette salsa with yellow onions, but you can substitute to your favorite kind of onion here. Such fabulous shots, wanna dig in right away! This is definitely something new I’ll be trying out this summer, it looks nice! Do you have a good recipe for pão francês? My husband lives in Brazil and misses them so much! Hi Calli, I haven’t made my own pão francês yet, but it’s on my bucket list. I’ll start developing a recipe and will post in the near future! :) Nothing like some pão francês with butter in the morning, right? I’m excited for you to post it!! Excellent recipe. The only modification I made was to decrease the EVOO (preference). It tasted exactly like the steakhouse. I let it rest in the fridge overnight. Hello Olivia! Grettings all the way from South Korea! I know I’m very late to comment here but I must ask you for help! I recently tried Feijoada for the first time and I absolutely loved it! But what stood out the most to me was the amazing sauce I had with it. It looked just like this but it was spicy! Am I thinking of a different sauce or did the spicy loving koreans just put their own touch to it? Is there anyway to somehow add some spiciness to your wonderful recipe? Try adding some very finely minced fresh chili pepper. Adjust the heat to your taste by varying ing the amount you add… Start with less and increase very slowly until its as spicy as you want. Wear gloves when working with hot chiles to protect your skin: don’t transfer any to your mouth or eyes! I found your recipe when I was looking for a way to copy the fresh mild salsa at my favorite Brazilian restaurant. I also made hot sauce, because the feijoada recipe I was following mentioned making a fresh hot sauce. It was very simple: I combined the salsa ingredients and then set some of it aside before adding the vinaigrette. I put the un-dressed salsa in my food processor with some lime juice and a fresh, de-seeded habanero chili pepper. It came out really yummy and solved the problem of different people enjoying different levels of spiciness. Some people just had the salsa, some added a few drops of hot sauce, and some used lots of hot sauce! I also had to get creative with the farofa because I couldn’t find any manioc flour: I whizzed oatmeal to the right consistency in the food processor and then toasted it in a skillet with olive oil. Although not authentic at all it actually came out good, and hit the same gritty/toasty texture and flavor profile that farofa does, although it wasn’t quite as good at soaking up and thickening the broth in the feijoada. I made this side dish to go with the Feijoada and white (jasmine) rice for my best friend and his soon to be husband who is from Brazil. He was so impressed that I went out of my way to make him food from his home country and even called his cousin to FaceTime with hime and show him what I made. He said it tasted just like home! So thank you for helping me make tonight’s dinner a HUGE success! Oh that’s so sweet! I’m glad it was a hit!